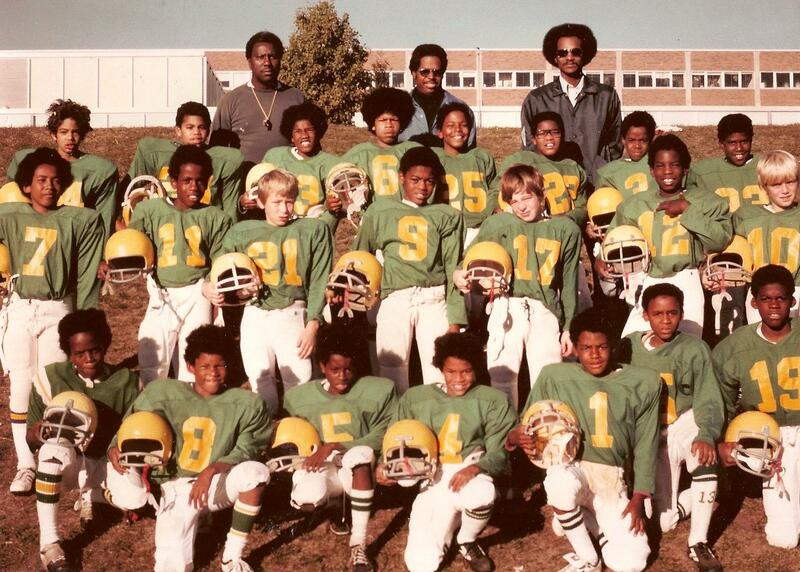 Thanks to Ann Kegley, recreation director at McRae Park, for these photos of youth football teams from McRae. None of the players or coaches in these photos is identified. If you can identify anyone, send me a note. The team wore the jerseys of the Seaman Gilfoy VFW post. I can find little information online about that post. Did the post sponsor teams only at McRae Park or other parks, too? I love it when people label photos. The next one is not even identified by year, but looking at hair styles, I’m guessing mid-1970s. Could the building in the background be Regina High School? The final older football team photo we found was taken in 1979. The photo was also labelled “light cubs” apparently referring to the weight class in which the team played. Does anyone know anything about any of the sponsors of the 1979 team: Ken and Norm’s, Cruse Construction, Eddie’s Barber Shop and Benedict? I’d especially like to know who the coaches in these photos are. Could the coach on the left in the middle photo be Edward Solomon? 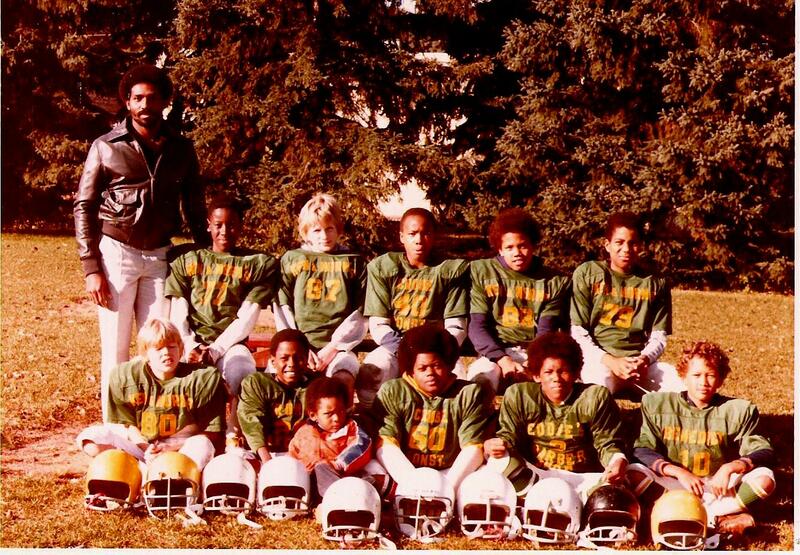 Solomon was one of the better-known volunteer football coaches in the Minneapolis park system. He was a park commissioner 1996-2002. A new park southwest of Lake Nokomis was named for him in 2004. McRae Park is unusual because it does not occupy all of the two square blocks on which it is located. The southwest corner of the park at 47th and Chicago is occupied by businesses. I have not found an explanation for why the park board didn’t acquire all of the land on those blocks — as it usually did. Ray N. Welter Heating moved to its present location on Chicago Avenue in the early 1940s not long before the land for the park was acquired in 1946. A person at the heating company told me the land that is now the park was a garbage dump when Welter moved its business to the site from Lake Street. Can anyone tell us the history of the street corner and why the park board didn’t buy all the land on that block? Some of the land for the park was purchased through condemnation; some was tax-forfeited land that the state owned and gave to the city. #3 troy flowers, #4 harry Jackson #5 peter morgan. There was a 7-11 and an Electrician place on Chicago that shared the land. All around 11years only. I think we were 6th Grade at Field. Sponsors were all of the above. They handed out Jerseys for all of the teams. There was not a designated Jersey for a team of group. Thanks, Ryan. Great info. You guys must have been pretty good! I can help Chuck Solomon with 2 more players from the center photo. 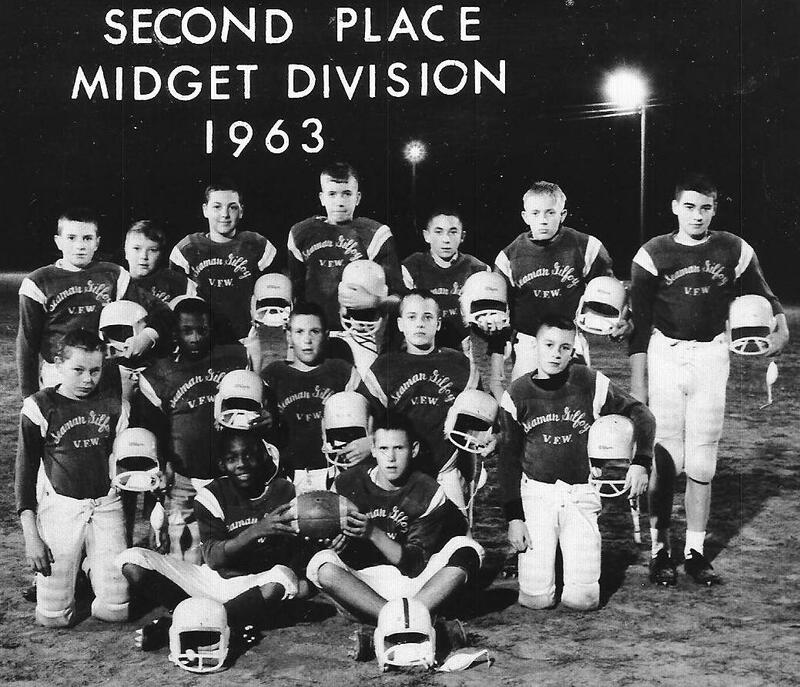 In the middle row #21 is Jimmy Moore, that’s me, and I believe #17 is Paul LaLiberte’. Coach Solomon coached me for 3 years on the McRae team. What a great coach and great man. Excellent, Jim. Thanks for your comment and for help completing the roster. I was 10 years old when we posed for the photo in the middle. It was the last game of the season in or around October 1976 and the location was Kenny Park. That’s Anthony Jr High in the background. The coaches from left to right were my dad, Edward Solomon, Levi Brady and Roger Day. I can identify all but three of the players and they are as follows: Back row: #24, Steve Starks, Jason Bruce, #13, Tony Day, #6, Cary Puckett, #25, Robbie McGinnis, and #23, Charles Williams. Middle Row: #7, Stanley Tarr, #11 Jeff Emmonds, #9, Rodney Ross, #12 (me), Chuck Solomon, and #10, Greg Elfstrum. Front row: Danny Sheffield, #8 Brandt Williams, #5, Raymond Moore, #4 Jeff Brady, #1 Jeff Robinson, Sean Alderson, and #19, Darryl Zachary. That season was the third and last that my dad coached me but he did later coach my son in 1995 before retiring from coaching after over 30 years. Wow, that’s phenomenal, Chuck. Thanks so much. If you have other photos or recollections of those times, I’d be happy to post them here. I was delighted to be introduced to your mother at a park board event shortly after the publication of my book. I was on that ’79 team and the other sponsor’s were Pepito’s and Ray N Welter HVAC. Thanks, Bill. And thanks to Pepito’s and Ray N. Welter as well as the other sponsors. I hope they all stll support youth sports. I am trying to get some information on a McRae Park Neighborhood Celebraton/Reunion that was held at the park in the summer of 2010. I was born and raised in Minnepolis and lived on 48th and 3rd Ave South. I’m interested in finding out if this event will be held in 2011. Thankyou, for any assistance. Helen, you might try contacting the McRae Park Recreation Center: mcrae@minneapolisparks.org or 612-370-4909. If anyone has more info, post it here or send to me at the address below and I’ll pass it on. Thanks, Dale, great tip. I’ll check it out.